I watched GUN FURY expecting a surprise. 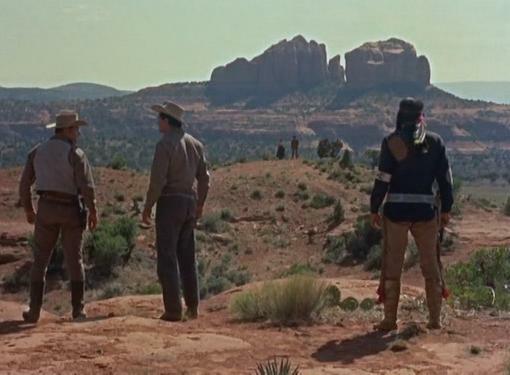 What I got instead was a routine Western, not bad for its type, bolstered by a better-than-average cast, solid direction from veteran Raoul Walsh , and some lavish Technicolor location footage from Sedona, AZ. But I kept waiting and waiting for that “surprise” that never came. What am I talking about? Read on and find out, buckeroos! Ben Warren, a peaceful Civil War vet, meets his intended bride Jennifer Ballard at the stagecoach station. The two lovebirds intend to travel to the next stop and get hitched. 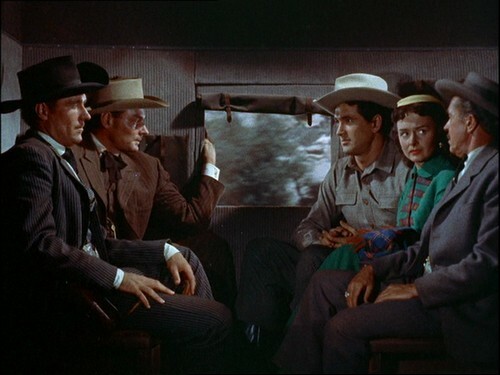 Also onboard the stage is mean desperado Frank Slayton, an “unreconstructed Southerner” feared across the territory, and his partner-in-crime Jess Burgess. Frank’s gang, disguised as Cavalry soldiers, lie in wait and rob the stage of it’s shipment of gold, stealing the loot killing everyone except Jennifer, who Frank has designs on and kidnaps. Yup, it’s a chase Western, with the novelty of being a 3D release, which must’ve looked cool at the time, but falls flat when watching on the TV screen. The saving grace here is the impressive cast, with young Rock Hudson starring as the intense, earnest Ben, on a quest to save his ladylove. She’s played by Donna Reed , who makes for a pretty woman-in-peril (and would win the Oscar that same year for FROM HERE TO ETERNITY). 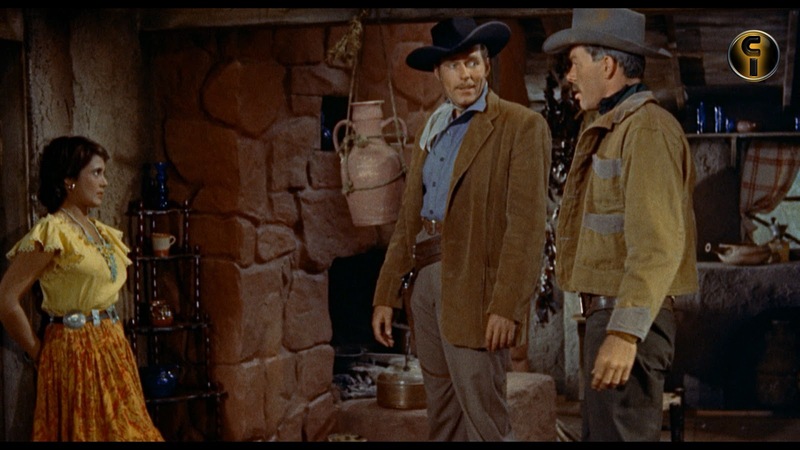 Phil Carey gives a good performance as bad hombre Frank, and Leo Gordon does a fine job as Jess. Lee Marvin and Neville Brand play members of Frank’s gang, and Roberta Haynes tries hard as Frank’s Mexican squeeze Estella. 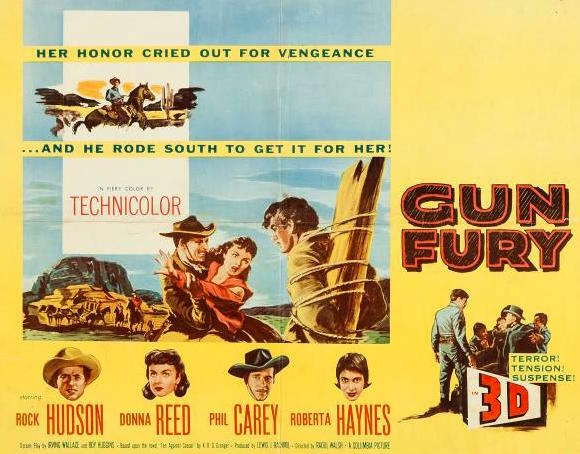 Director Walsh was responsible for some macho screen classics (WHAT PRICE GLORY, THE ROARING TWENTIES , HIGH SIERRA, WHITE HEAT ), but unfortunately GUN FURY isn’t one of them. Like I said, it’s okay for what it is, it’s just not up to Walsh’s usual high standards. 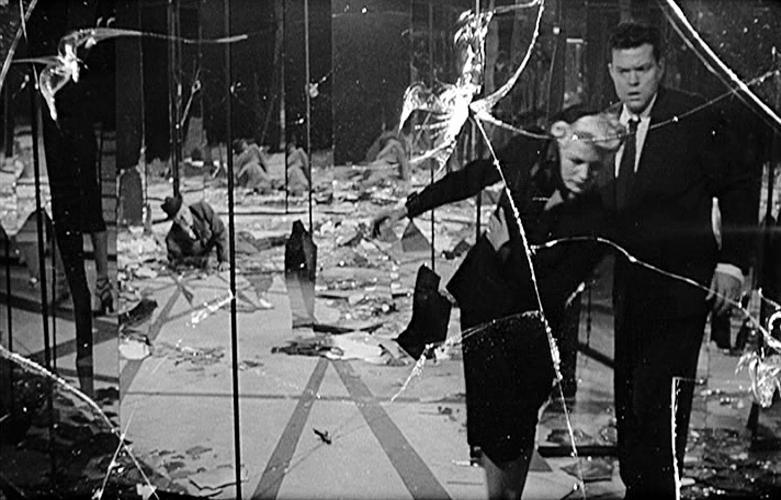 The screenplay was co-written by novelist Irving Wallace, whose books THE CHAPMAN REPORT, THE MAN, and THE SEVEN MINUTES were made into films, and Roy Huggins, who later created such TV hits as MAVERICK, 77 SUNSET STRIP, THE FUGITIVE, and THE ROCKFORD FILES. The Sedonia scenery is gorgeous to look at in Technicolor, and Mischa Bakalieinikoff’s music is appropriately rousing. I recorded GUN FURY off The Sony Channel a while back because under the “Cast and Crew” listing on my DVR was a name towards the bottom that made me want to see the film. It simply stated “James Cagney as The Villain”! Though I couldn’t find any other information, I figured the great Cagney might have done a cameo as a favor to his friend Walsh. So I sat and waited… and waited… and waited, right up until the very end. Cagney was nowhere to be found!! At least, I couldn’t find him! Why he was listed in the first place, I have no idea. So if you choose to watch GUN FURY, don’t expect any “surprise” appearance from Jimmy. Just make yourself some popcorn, sit back, and enjoy an average Western with an above-average cast. 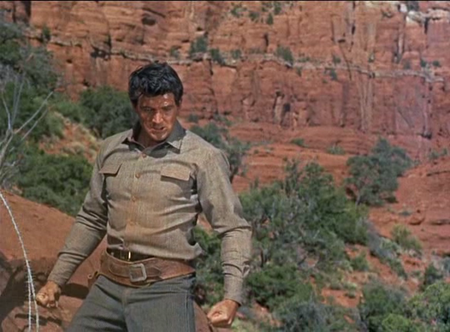 I like the Rock Hudson film, Magnificent Obsession (1954). Next PostNext Familiar Faces #9: Stooges, Chorus Lines, and Ethelreda Leopold!